Hi everyone! 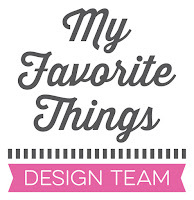 Today is the third day of the My Favorite Things September release countdown. This release is packed with amazing new products and it was so fun to play with all the new stuff! I decided to create a heart wreath with this fabulous and versatile Bold Blooms stamp set! I first drew a heart with pencil onto a watercolor panel that I cut from the Stitched Mini Scallop Square STAX die. I used the Pierced Heart STAX as a stencil for my heart shape. I then stamped the leaves with Crushed Olive Distress ink around the heart. I colored them with watercolor paint (Winsor & Newton tubes). Once it was dry, I erased the pencil line. I added a few red berries around the wreath that I made with the Nuvo Crystal Drops Autumn Red. 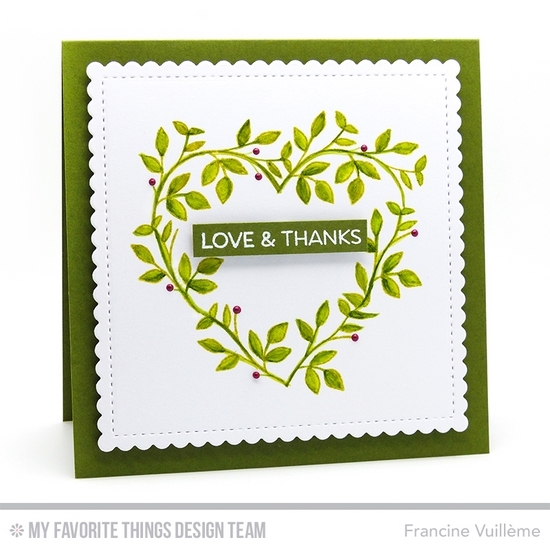 The sentiment is from the newest Geometric Greenery. I heat embossed it onto Jellybean Green cardstock with white embossing powder. I fixed the sentiment on top of the wreath and the white scalloped panel on a top-folded card base made from Jellybean Green cardstock too. I used foam pads for more dimension. Love your card, very nice! So creative. Beautiful card. The Bold Blooms is my favorite of this day's release. Wow very pretty, and a lot of work but well worth it!! Love how elegant this card looks. The little pops of red look fabulous. How beautiful! This is so creative. Francine! I LOVE this card! I love the Square shape and the Heart you created from the leaf stem from The Bold Blooms is unbelievable! It looks like it was hand painted! Amazing creativity! I am in awe! wow! The wreath is simply beautiful and very creative of you! WOW!!! Your heart wreath is so beautiful, Francine! The heart shape is so pretty, and your watercoloring on the leaves is amazing! Love your crisp, clean design, too...such a stunning card!